“The result that we hoped for is being achieved little by little,” she said. The hearing updated the judge on the archdiocese’s safe environment efforts in the past six months, which included an independent, external audit that found the archdiocese was substantially compliant with the terms of a settlement agreement the archdiocese reached with the Ramsey County Attorney’s Office in December 2015. The archdiocese “put its shoulder to the work, which so needed to be done,” Ring said. The 40-minute hearing fulfilled an obligation the settlement agreement on charges the county had filed against the archdiocese in June 2015. The charges alleged that the archdiocese had been negligent in the case of three brothers who were sexually abused by former priest Curtis Wehmeyer in 2010 and 2011. The settlement agreement was amended in June 2016 at the same time Ramsey County dismissed criminal charges it had filed against the archdiocese in the same case. The Jan. 5 report was the fourth six-month report the archdiocese and Ramsey County Attorney’s Office have presented in Ramsey County Court. In August, New York-based StoneBridge Business Partners conducted an in-person audit of the archdiocese’s policies and procedures and compliance. The audit included interviews with at least 30 archdiocesan leaders, employees, pastors, lay leaders and school representatives, as well as on-site visits at or information requests from 23 parishes and Catholic schools in the archdiocese. In a report the archdiocese published on its website Jan. 5, StoneBridge outlined the audit’s objective and scope, procedures and information obtained. During the hearing, the archdiocese’s attorney announced the archdiocese and Ramsey County Attorney’s Office have selected former Hennepin County Attorney Thomas Johnson to serve as an ombudsperson. His role is independent of the Ramsey County Attorney’s Office and archdiocese, and he’s available as a confidential resource for victim/survivors, as well as people who have a concern about how a report to the archdiocese is being handled. Ramsey County Attorney John Choi and Archbishop Bernard Hebda attended the hearing, and, along with Johnson, spoke to media afterward. 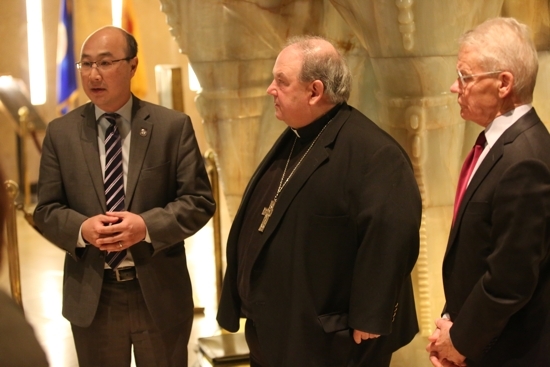 Choi said that he wanted to publicly express his satisfaction with the archdiocese’s efforts. Archbishop Hebda also reacted positively to the hearing. Choi also commended the archdiocese’s restorative justice efforts with victims, noting that the archdiocese has engaged some worldwide leaders in its outreach. Among StoneBridge’s findings was that 92 percent of the approximately 2,500 Church personnel in the archdiocese are fully in compliance with the “Essential Three” requirements of a background check, VIRTUS training and signing a Code of Conduct. During the hearing, Warner called the 92 percent rate “good,” but asked for an explanation for it being less than 100 percent. Tim O’Malley, the archdiocese’s director of Ministerial Standards and Safe Environment, said the rate had been mostly affected by missing or incomplete paperwork at parishes and schools, and that the internal audit team has adjusted its procedures for examining documentation to work toward 100 percent fully documented “E3” compliance. At the end of the hearing, Warner said that with the 92 percent compliance rating, “there’s room for improvement, but the bar was set pretty high.” Ring said that the Ramsey County Attorney’s Office was satisfied with the rate. “The archdiocese wasn’t happy with 92 percent, either,” Archbishop Hebda interjected. During the hearing, O’Malley also testified to the archdiocese’s efforts in educating fourth-year major seminarians about the trauma experienced by clergy sexual abuse victims/survivors through a two-hour presentation his office hosted at the St. Paul Seminary School of Divinity, during which a survivor shared his story.